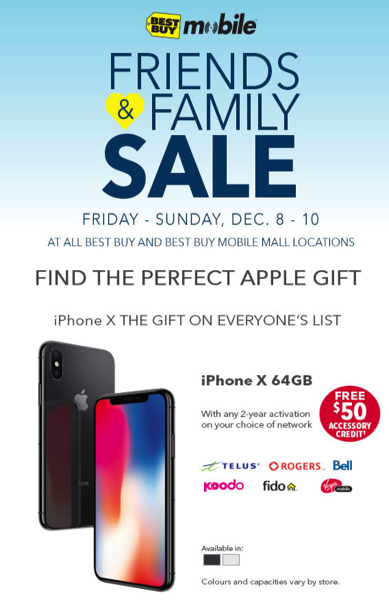 Best Buy has a Friends and Family sale this weekend, starting today, December 8 until December 10. 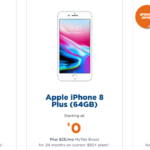 All iPhone X sales on a two-year contract with Telus/Koodo, Rogers/Fido or Bell/Virgin will get a $50 accessory credit. iPhone 7 32GB is available for $0 on a two-year term on Bell and Telus and comes with a free $100 store gift card. iPhone 6 32GB is $0 on contract with Koodo and Fido, but also comes with a $175 gift card. Also, iPad 32GB Wi-Fi and Cellular is available for $299.99 on select two-year plans with Rogers and Fido. If you were about to sign a contract for an iPhone, Best Buy might be the place to go to get some extras.